Please note that the contents of these Council and Committee Agendas have yet to be considered by Council and officer recommendations may be altered or changed by the Council in the process of making the formal Council decision. 1.1 An apology has been received from Councillor Walker as he is away on Council business. 4.1 Sharon Webber - Hearing Nelson , will speak about the Silent Leadership Challenge. 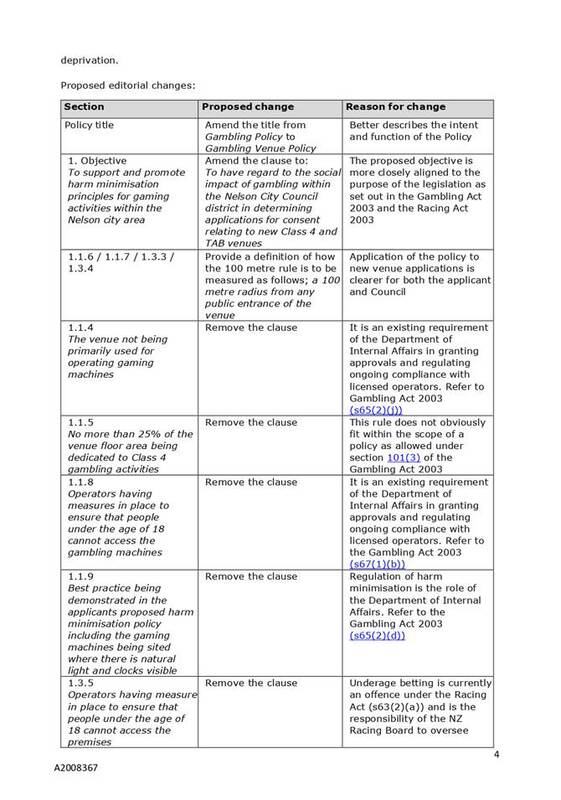 4.2 Steve Cross will speak about the Notice of Motion in relation to recording of public workshops. 4.3 Graeme O'Brien will speak about his research relating to public notification of workshops. Confirms the minutes of the meeting of the Council, held on 9 August 2018, as a true and correct record. Adopts the Governance Members’ Protected Disclosure Policy (R9579). Adopts the Solid Waste Asset Management Plan 2018 - 2028 (A1828548). Adopts the Water Supply Asset Management Plan 2018-28 (A1620958), amended to reflect the approved Long Term Plan 2018 - 2028 including the renewal of existing residential water meters with manual read meters. Approves the use of Paxsters on selective routes for a period of 24 months and works with NZ Post to finalise exclusion zones as shown on Attachment A1990504 of Report R8928. Adopts the Parks and Reserves Asset Management Plan 2018-28 (A2004774) amended to reflect the approved Long Term Plan 2018 – 2028. 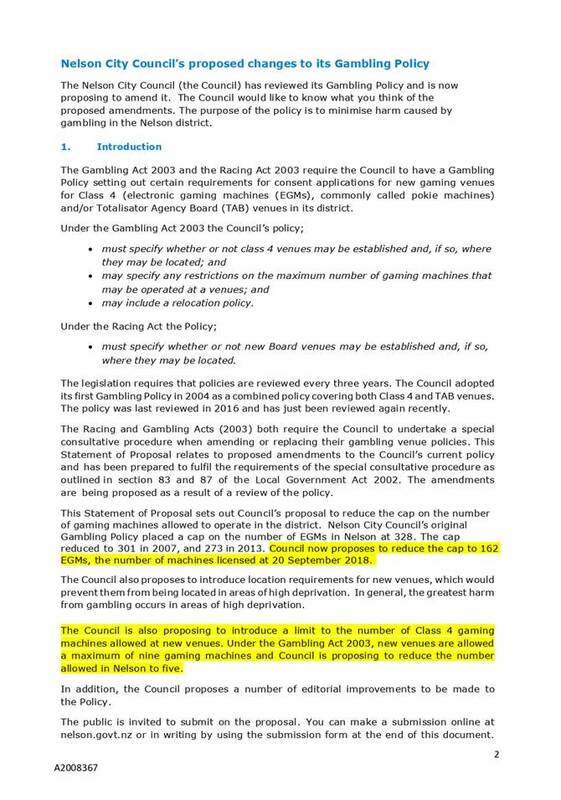 Approves the proposed process and timeframes for consultation set out in the report Review of Council's Gambling Policy (R9358). 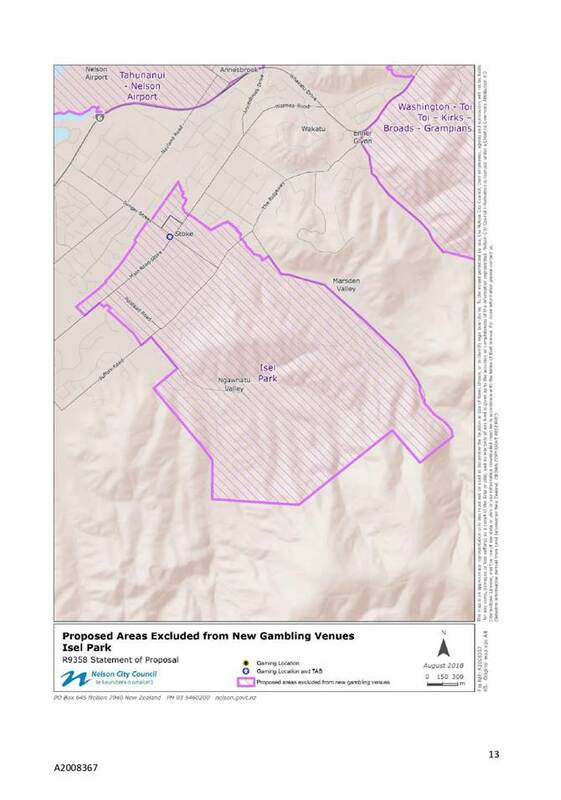 Confirms the easement in gross over the area shown in red on the plan (A2019437) of Saxton Field be agreed to under section 48(1)(d) of the Reserves Act 1977, acting pursuant to a delegation from the Minister of Conservation. Approves the amended Nelson Festivals Trust Deed (A2029206). Approves rolling over the interest free loan to Nelson Enterprise Loan Trust for a further one year through to September 2019 while a sustainable business model is developed by the Board. Approves the allocation of $25,000 unbudgeted expenditure to increase the operational grant of the Nelson Centre of Musical Arts from $125,000 to $150,000 for financial year 2018/19. Approves unbudgeted funding of $15,000 for the Septura Residency for Brass Instrument Performers event to support the Nelson Centre of Musical Arts as it seeks to maximise its newly renovated venue. Receives the report Mayor's Report (R9684). This report was not available when the agenda went to print and will be distributed separately. Confirms that Nelson City Council live-streams all Regional Transport Committee’s public meetings and public workshops. Amends the section of resolution CL/2018/186 that relates to the time during which Upper Trafalgar Street will be closed to traffic so that the street will be closed to all vehicles, apart from emergency vehicles and other vehicles specifically authorised by Council’s network coordinator, from 07:00am every day to 07:00am on each following day. 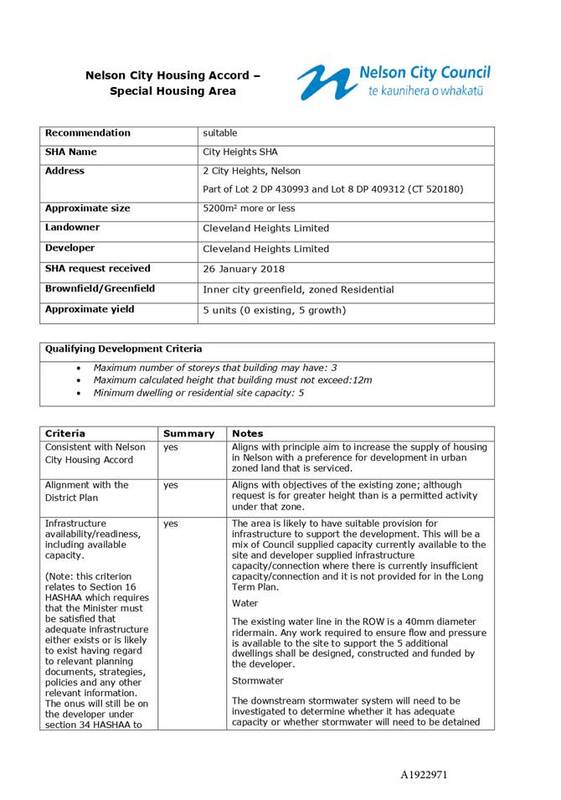 Approves the change in qualifying development criteria from 2 storeys to 3 storeys as shown in Attachment 1 (A1922971). On Thursday 9 August 2018, commencing at 9.09a.m. In Attendance: Chief Executive (P Dougherty), Group Manager Infrastructure (A Louverdis), Group Manager Environmental Management (C Barton), Group Manager Community Services (R Ball), Group Manager Corporate Services (N Harrison), Group Manager Strategy and Communications (N McDonald), Team Leader Governance (R Byrne), Governance Adviser (E Stephenson) and Youth Councillors Alex Hunter and Nico Frizell. Councillor Noonan gave the opening prayer. Her Worship the Mayor advised that the meeting would need to move into public excluded session at mid-morning and after lunch to provide for the travel schedules of external advisers. 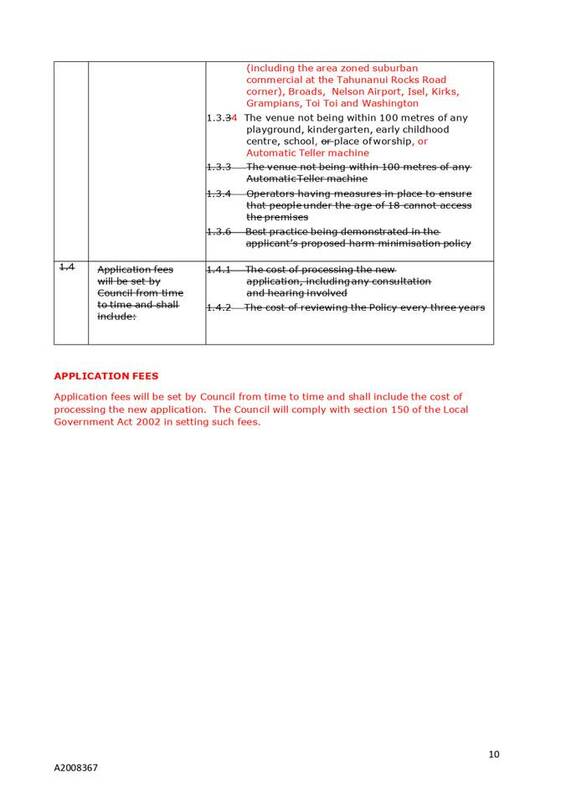 There were no updates to the Interests Register; Councillor Matheson declared an interest with the item relating to 1 Kinzett Tce on the Public Excluded Agenda. Attendance: Councillor Acland left the meeting at 9.12a.m. Mr O’Brien spoke about transparency of process and the rights of Nelson residents to participate in local government processes. He thanked Councillor Lawrey for the Notice of Motion on the agenda to live-stream public workshops. He felt that reasons given for holding workshops with the public excluded were flimsy. He further noted that once workshops were live-streamed he expected more would be held outside the Chambers. Mr O’Brien outlined that he had asked Council for a schedule of workshops and which were open to the public and was not satisfied that he been provided with sufficient information. Attendance: Attendance: Councillor Acland returned to the meeting at 9.16a.m. Mr Morrison thanked Council for the trial in closing Upper Trafalgar Street over the previous summer. He noted that with the capital investment businesses had made, they hoped this would be ongoing. Mr Morrison indicated that locals and visitors had a place to congregate and instantly felt like a community. Mr Morrison and Mr Widley advised that communication between all businesses in area had become a lot more cohesive over the trial period and also suggested that Council could invest in more tables and chairs in the public area. They noted 1903 square was under-utilised and Council could promote better use of this public space. Michelle Hunt spoke to the Upper Trafalgar Street closure for summer and suggested making the area Smokefree, if possible, for the period of the closure. Michelle gave a presentation on a smokefree pilot that the Cancer Society and Public Health had been working on (tabled) and asked for Council’s support in progressing smoke free outdoor dining in public spaces. Amme Hiser spoke to Council on providing compostable materials at Council events rather than recyclable materials. She noted that mixing recyclable and non-recyclable material was currently an issue and if products were mixed they went to landfill. She noted that while compostable products do need an aerobic environment to be composted (hot composted) this was significantly better than the mixed waste that would go landfill. Ms Hiser was working with Greenwaste to Zero to work on compostable event waste. Foodscraps were a resource consent issue and she asked that this be addressed as well. Document number M3572, agenda pages 13 - 34 refer. Confirms the minutes of the meeting of the Council, held on 21 June 2018, as a true and correct record. 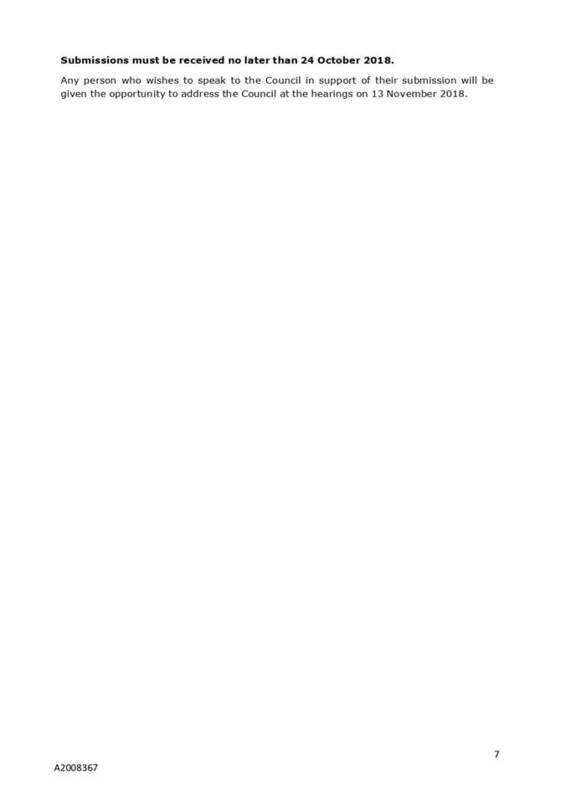 Document number M3601, agenda pages 35 - 37 refer. Confirms the minutes of the extraordinary meeting of the Council, held on 2 July 2018, as a true and correct record. 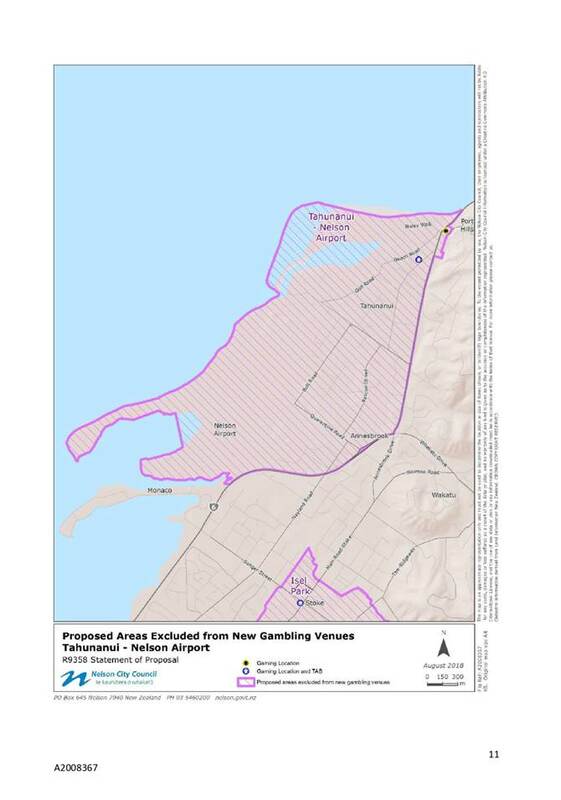 Approves that the Nelson Tasman Joint Waste Working Party Terms of Reference (A1831374) be amended to reflect the additional Nelson City Councillors of Matheson and Dahlberg as well as the addition of Tasman District Councillors Ogilvie and Wensley. Council discussed the recent notification that a market in Indonesia had been found for some recyclable materials. Senior Asset Engineer – Solid Waste, Johan Thiart reassured Council that contrary to a recent TV documentary, products from Nelson were very clean and were marketed by reliable commercial entities. He was confident that Nelson recyclables were going to remanufacturing. Attendance: Councillor Matheson left the meeting from 10.05a.m. until 10.08a.m. Chief Executive, Pat Dougherty, advised that there would be an update on the status of the recycling market as part of the 2019/20 Annual Plan discussions. Approves the funding resulting from the global drop in commodity prices for the 2018/19 financial year at an estimated cost of between $88,500 and $94,500, funded from current reserves in the Solid Waste account. The meeting adjourned at 10.15a.m. to recognise Mr Bill Findlater’s contribution to Nelson Regional Development Agency. Her Worship the Mayor presented Mr Findlater with a plaque of the City of Nelson crest to acknowledge his service to the city, along with a gift from Nelson City Council. The meeting reconvened at 10.53a.m. A public excluded report titled Legal Advice - Greenmeadows was to be considered as a late item. The information was time sensitive and had come to hand after the agenda had been distributed. 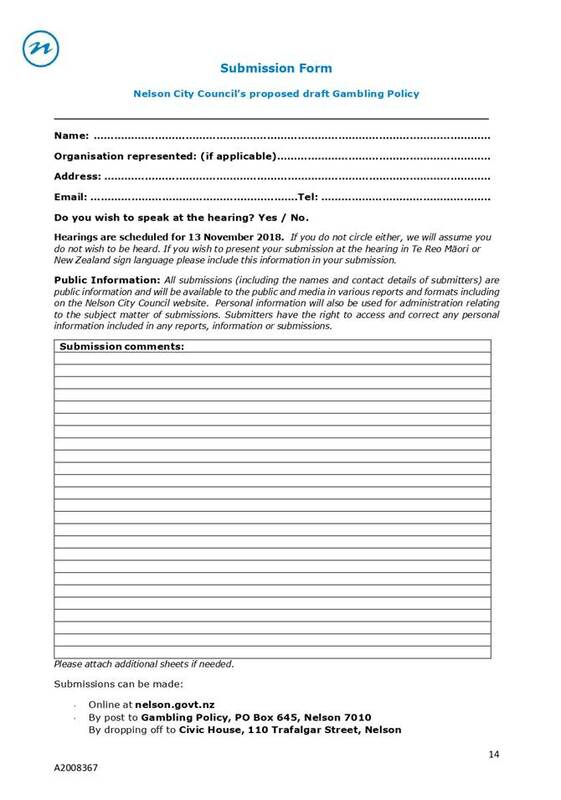 Considers the public excluded item regarding Legal Advice - Greenmeadows at this meeting as an item not on the agenda, pursuant to Section 46A(7)(a) of the Local Government Official Information and Meetings Act 1987, as the legal advice is time sensitive. Kerry Anderson and Rachel Taylor of DLA Piper were in attendance for Item 3 of the Public Excluded agenda to answer questions and, accordingly, the following resolution was required to be passed. Notes, in accordance with section 48(6) of the Local Government Official Information and Meetings Act 1987, the knowledge that Kerry Anderson and Rachel Taylor possess relates to legal advice. The meeting moved into Public Excluded at 10.58a.m. and reconvened at 12.56p.m. at which time the legal adviser and Trust members providing advice on Item 4 of the Public Excluded Agenda were present at the meeting. Stuart Ritchie from Fletcher Vautier & Moore and Trust members Peter Dawson, Andy Joseph and Buzz Falconer were in attendance for Item 4 of the Public Excluded agenda to answer questions and, accordingly, the following resolution was required to be passed. Notes, in accordance with section 48(6) of the Local Government Official Information and Meetings Act 1987, the knowledge that Stuart Ritchie , Peter Dawson, Andy Joseph and Buzz Falconer possess relates to legal advice and the lease. The meeting moved into Public Excluded at 12.58a.m. and reconvened at 3.00p.m. Approves the revised fees and charges for Community Facilities and Parks for 2018/19 outlined in the report R9397 and its attachment (A1984651). 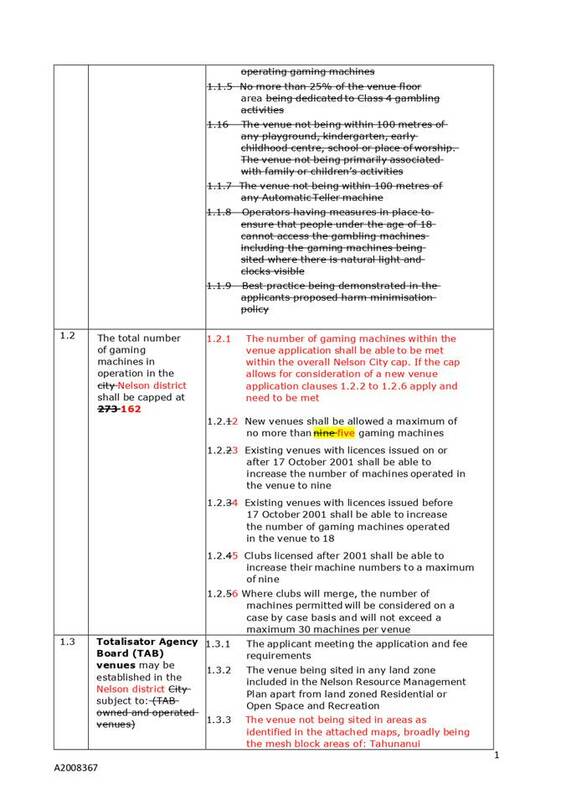 An administrative error had been identified with the table on Page 2 of the Statement of Proposal which would be corrected. This correction was for charges to be comprehensive. Changes were outlined and tabled. Agrees that a summary of the Statement of Proposal is not required. 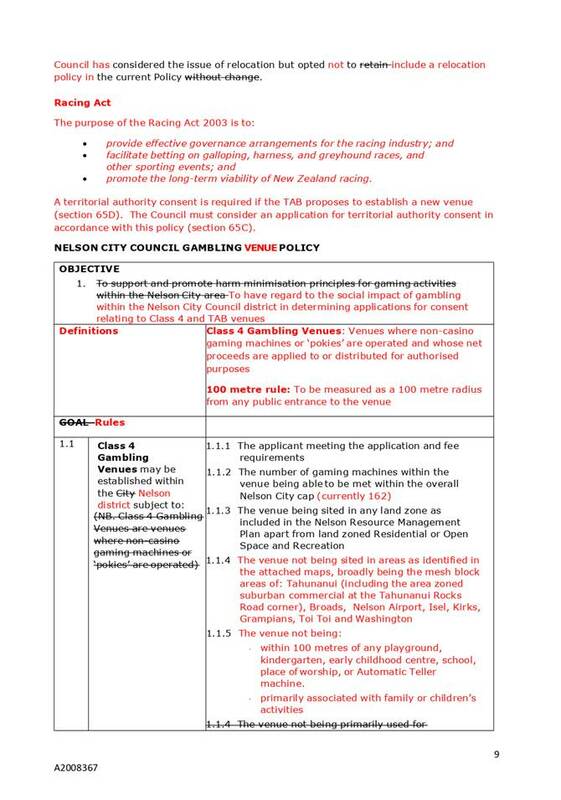 · the Draft Nelson Resource Management Plan change for public feedback. Requires the Nelson Regional Development Agency to ensure the Events Contestable Fund is operated within the yearly allocation by 2020/21. Document number R9386, supplementary agenda pages 4 - 74 refer. Her Worship the Mayor tabled an addendum to the Mayor’s report which outlined travel to join a visit to Denmark and required Council approval. Her Worship the Mayor presented her report and answered questions on the proposed Committee structure, the visit to Denmark and a proposed southern hemisphere Climatorium. Appoints John Murray and John Peters as External Appointees of the Governance Committee. Notes that the Delegations Register and Governance Statement will be updated accordingly to reflect these changes. 1 A2032748 Addendum to Mayors Report 09Aug2018. Document number R9522, agenda pages 38 - 51 refer. Group Manager Strategy and Communications, Nicky McDonald and Senior Legal Adviser, Fiona McLeod presented the report. Chief Executive, Pat Dougherty explained that a potential legal risk had been identified with the classification of local purpose reserve, recreation. The classification was proposed to be updated to local purpose reserve, outdoor leisure, conservation and education. Attendance: Councillor Acland left the meeting from 3.30p.m until 3.36p.m. Attendance: Councillor Noonan left the meeting from 3.37p.m. until 3.39p.m. Ms McLeod explained that there were legal tests on how to choose a specified purpose and it must not be duplicating the primary purpose of the reserve so by using the word ‘recreation’ Council was introducing legal risk. Using the word outdoor leisure was still aimed at picking up the same activities. Attendance: Councillor Rutledge left the meeting from 3.45p.m. until 3.48p.m. Ms McDonald answered questions on the reserve management plan vision and advised that ‘camping’ could be included in the classification to ensure the existing use of the campground be addressed. The number of Panel members were discussed and Councillors Acland and Skinner volunteered to be available; Councillor Fulton offered to chair the Panel. Approves the Terms of Reference for the Hearings Panel as set out in Attachment 2 (A1693973). Document number R9387, agenda pages 80 - 218 refer. Team Leader City Development, Lisa Gibellini presented the report. Delegates the hearing of feedback under section 78 of the Local Government Act and comments under clause 34 First Schedule of the Resource Management Act to a joint hearing panel comprising Councillors Lawrey and McGurk as members of the Steering Group plus Councillor Fulton together with three Tasman District Council Councillors (Councillors King and Bryant plus one other). Delegates to the hearing panel the power to make recommendations to the Nelson and Tasman Councils to adopt or amend the Nelson Tasman Land Development Manual and associated practice notes. Document number R9508, agenda pages 76 - 79 refer. Team Leader City Development, Lisa Gibellini presented the report and noted that the reference of 30-50 years in paragraph 2.8 should read ’30 years’. Approves the preparation of a Future Development Strategy for the Nelson and Tasman Regions in partnership with Tasman District Council. Document number R9392, agenda pages 52 - 62 refer. Group Manager Strategy and Communications, Nicky McDonald, presented the report. Delegates to the Mayor and Chief Executive to make any necessary minor editorial amendments prior to signing. Document number R9197, agenda pages 63 - 75 refer. Executive Officer, Michelle Joubert presented the report and answered questions on the practicality of including smokefree requirements in leases for outdoor dining areas and noted that lease agreements already existed and these could not be changed. New small lease agreements would be prepared for additional space that businesses would be using for closure but there would be a risk that one business had outdoor dining not covered by a new lease. Group Manager Environment, Clare Barton, advised that Council officers had been meeting with landlords and retailers in the CBD over previous weeks and acknowledged that some businesses would gain more benefit from the closure. Outdoor dining leases had been valued and were adjusted in relation to proximity to upper Trafalgar St so the benefits businesses gained from their location and closure of Trafalgar St would be proportional. Attendance: Councillor Acland left the meeting from 4.55p.m. until 5.00p.m. Notes that the summer 2018/19 closure of Upper Trafalgar Street will require net capital expenditure of $12,000, which will be funded from the CBD Enhancement budget. Requests officers to report to the Planning and Regulatory Committee on options to make Upper Trafalgar Street smoke free via Council’s Smokefree Policy, following discussion with businesses and retailers in the area. It was noted that smokefree included vapefree. Attendance: Councillor Noonan and Councillor Walker left the meeting at 5.07p.m. Document number R9572, agenda pages 219 - 221 refer. 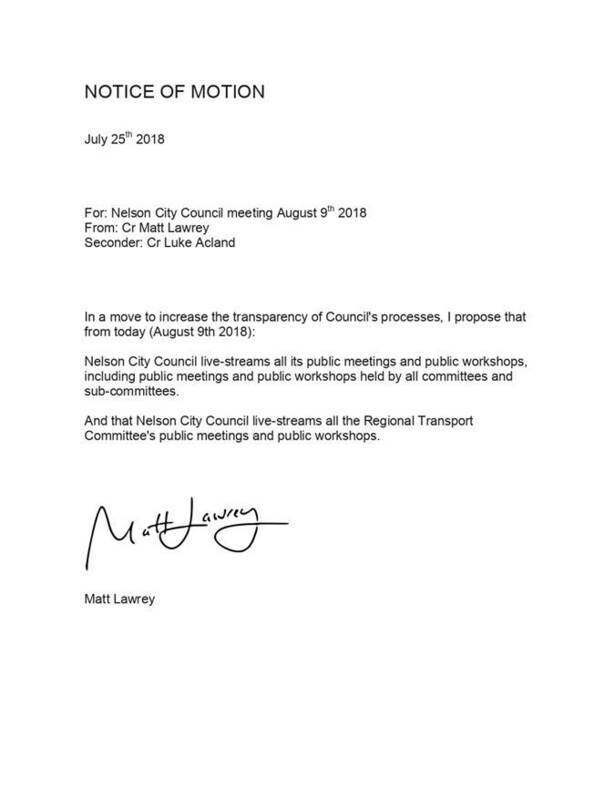 Councillor Lawrey presented his Notice of Motion to live-stream all public meetings and workshops and to live-stream the Regional Transport Committee. He noted this was a simple step to increase transparency, give greater access for the public to Council processes and hopefully lead to a greater interest into workings of local government. Attendance: Councillor Walker returned to the meeting at 5.09p.m. Her Worship the Mayor updated Council that after the last Regional Transport Committee, officers discussed live-streaming with Mr Jim Harland, the LTSA representative on the Committee. He had checked with the Agency there were no issues with participating while in a live-streamed meeting. Business Unit Manager Governance and Support Services, Mary Birch was called upon to provide some advice on the practice of other councils. Ms Birch advised that officers had sought feedback from the sector and it was clear that no other councils live-streamed and the few that did publicly notify workshops included this generically in a Council meeting schedule. 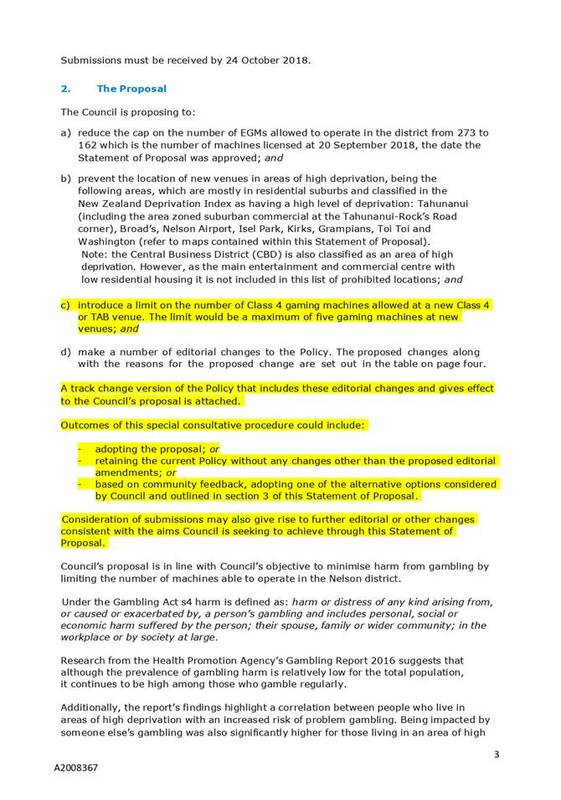 She noted that if Council chose to live-stream guidelines and protocols would need to be created and reiterated that workshops were not meetings because no resolutions or decisions were made. Group Manager Strategy and Communication, Nicky McDonald answered questions on constraint of discussion for officers and elected members and possible misreporting of comments taken out of context. Councillor Rutledge noted that no information had been received and this would not satisfy the proper decision making process. He moved a procedural motion that the matter be left to lie until an officer’s report on further information was brought to the Council meeting on 20 September 2018. Leaves the item Notice of Motion from Cr Lawrey: Live-streaming Public Meetings and Workshops to lie on the table until an officer’s report with further information is brought to the Council meeting on 20 September 2018. Attendance: Councillor Acland left the meeting at 5.39p.m. The meeting went into public excluded session at 5.39p.m. and resumed in public session at 6.11p.m. There being no further business the meeting ended at 6.11p.m. 1.1 To update Council on a number of current matters. 2.1 The Mayor donated $464.00 from the Mayoral Discretionary Fund for the cost of venue hire of Trafalgar Park for the ‘Get Ballsy’ charity football match which is being held on Saturday 29 September. This charity match is to raise money for Testicular Cancer New Zealand for the purpose of furthering awareness and supporting men and families living through a testicular cancer experience. 2.2 The Mayor donated $500.00 from the Mayoral Discretionary Fund to the Te Huinga Whetū Kapa Haka competitions which are being held in Nelson on 27 September. Te Hunga Whetū is the Te Tauihu o te Waka a Māui (Nelson/Marlborough) biennial kappa haka event for primary and intermediate aged students. This event will be held at the Trafalgar Centre and 19 teams from across Te Tauihu are expected to enter. Due to time constraints the following reports were not available at the time the agenda went to print. 2.3 An update will be provided at the meeting. 2.4 A presentation will be provided at the meeting. 2.5 An update on the acknowledgement of the anniversary of 125 years of the Suffrage movement will be provided at the meeting. 1.1 At the Council meeting on 9 August 2018 this item was left to lie pending an officer’s report. This report has been included in the Agenda. 1.2 To consider the notice of motion from Councillor Matt Lawrey requesting that all Council public meetings and workshops be live-streamed. 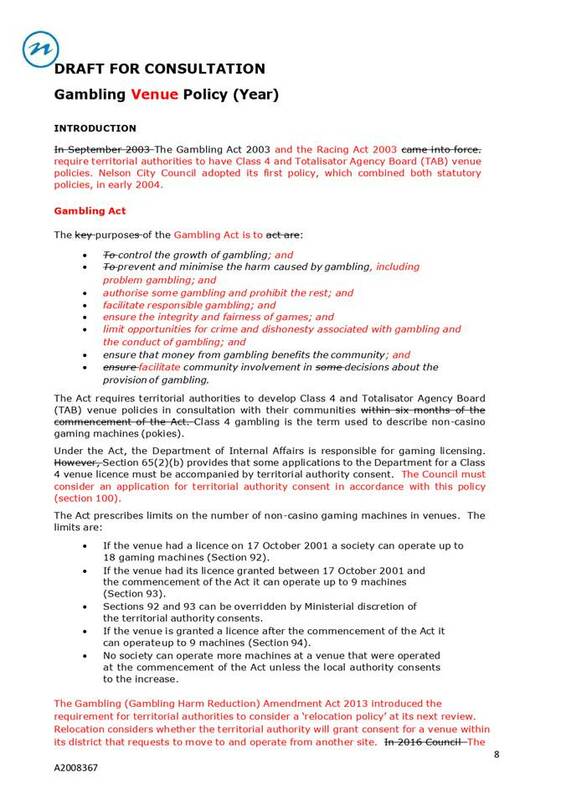 2.3 A copy of the Notice of Motion received by the Chief Executive from Councillor Lawrey is attached. 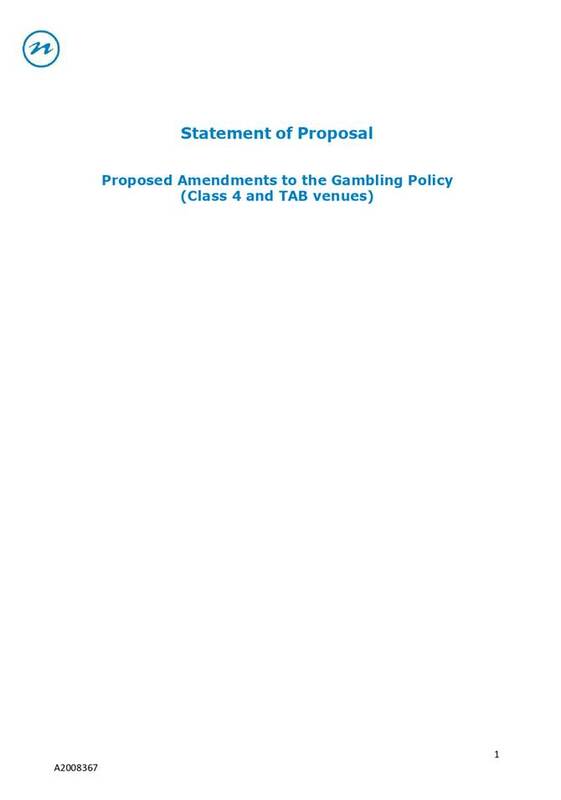 1.1 To amend a section of a resolution made on 9 August 2018 in relation to Upper Trafalgar Street. 2.1 On 9 August 2018, Council approved the temporary closure of Upper Trafalgar Street over summer 2018/19. The time during which the street will be closed every day, is stated in the resolution as, “From 09:00am every day to 07:00am on each following day…” but it should be from 07:00am every day until 07:00am on each following day. A further resolution is required to amend this. 4.2 The time during which the street will be closed every day was mistakenly set from 09:00am every day until 07:00am on each following day, in the above resolution. 4.3 The result is that the street will be open to all traffic for two hours every morning. This is contrary to the intent of the August report, that a pedestrianised area be created in Upper Trafalgar Street by temporarily closing the street to traffic for 24 hours a day from 8 November 2018 until 30 April 2019. It is suggested that the resolution be amended in order to achieve the intent of the August report. 4.4 During the trial closure over summer 2017/18, Upper Trafalgar Street was open to delivery vehicles for two hours every morning. This was in order to enable the delivery of stock to restaurants. However, this two-hour slot is not required as all but one of the hospitality businesses take delivery of goods in the laneways running on either side of Upper Trafalgar Street. 4.5 The one hospitality business that cannot take deliveries in the laneway will be able to make use of the short-term parking space that will be created in Selwyn Place during the closure or other nearby parking spaces for their deliveries. The other businesses in Upper Trafalgar Street (for example real estate businesses) that do not take deliveries of stock, but do receive post/parcels via couriers throughout the day, will also be able to make use of the short-term parking space for their courier deliveries. 4.6 Closing the street to traffic for 24 hours a day would increase pedestrian safety. Pedestrians in Upper Trafalgar Street may be unaware that delivery vehicles can enter the street at certain times of the day, and therefore there is a risk that pedestrians would not check for vehicles in this area. During the trial closure, officers were notified by business owners of a safety risk to pedestrians from courier drivers, who were observed driving down the street at speed. 4.7 Accordingly, it is proposed that the street be closed to traffic (except emergency vehicles and vehicles specifically authorised by Council’s network coordinator) from 07:00am every day until 07:00am on each following day for the 2018/19 closure. 5.1 The recommended approach is option 1, to amend the resolution made on 9 August 2018 so that Upper Trafalgar Street is closed to traffic (except emergency vehicles and vehicles specifically authorised by Council’s network coordinator) for 24 hours a day from 8 November 2018 until 30 April 2019. 5.2 The second option is to amend the resolution in order to allow delivery vehicles in Upper Trafalgar Street for two hours every morning. This will require an amendment to the resolution and officers can provide suggested wording if this is the supported option. Option 1: Preferred - Amend resolution - close street to traffic (except emergency vehicles and vehicles specifically authorised by Council’s network coordinator) for 24 hours a day. · As originally intended, Upper Trafalgar Street would be a pedestrianised zone for 24 hours a day from 8 November 2018 until 30 April 2019. · A small number of businesses would have to make use of the short-term parking in Selwyn Place or other parking spaces nearby for deliveries. Option 2: Amend resolution – allow delivery vehicles in Upper Trafalgar Street for two hours every day. · The small number of businesses that cannot take deliveries in the laneways would be able to take deliveries at their doors in Upper Trafalgar Street during a 2-hour slot every morning. · Increases risk of harm to pedestrians who may be unaware that delivery vehicles may enter the street at certain times of the day. · Upper Trafalgar Street would not fully pedestrianised. Council has already decided to close Upper Trafalgar Street temporarily over the coming summer 2018/19. A decision to close Upper Trafalgar Street is a discretionary activity which is expected to enhance Nelson’s CBD and contribute to the economic prosperity of businesses. - Our urban and rural environments are people-friendly, well-planned and sustainably managed. A decision to allow delivery vehicles to use Upper Trafalgar Street during the closure period increases risks to pedestrians. This decision to close Upper Trafalgar Street temporarily is a matter of low significance to the community as a whole but of high significance to hospitality businesses in Upper Trafalgar Street and other parts of the city. Community views were sought on the 2017/18 closure and a total of 321 submissions were received. Of these, 314 are positive about the closure and seven are not. Of those who are positive, 132 would like the street to be closed permanently. Further community consultation is not considered necessary. No consultation with Māori was undertaken for this report. 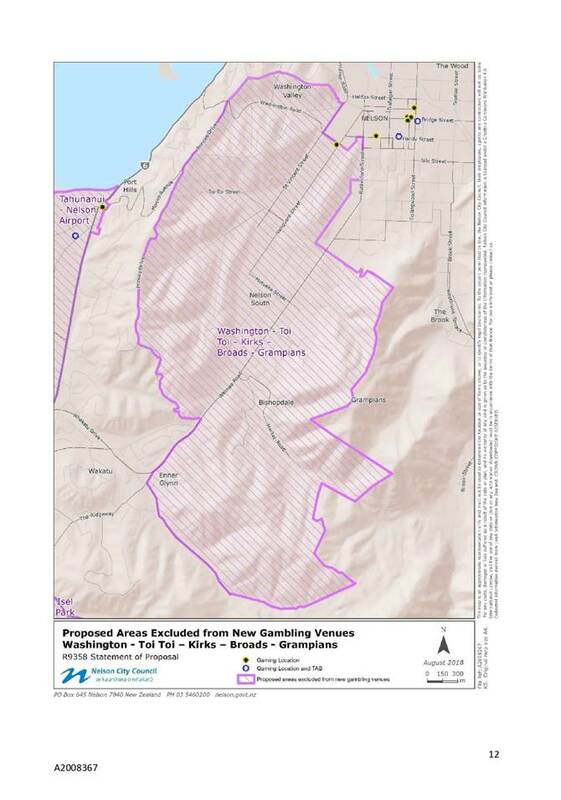 The decision relates to CBD enhancement, business, economic development and tourism, a temporary road closure, and temporary unavailability of parking. 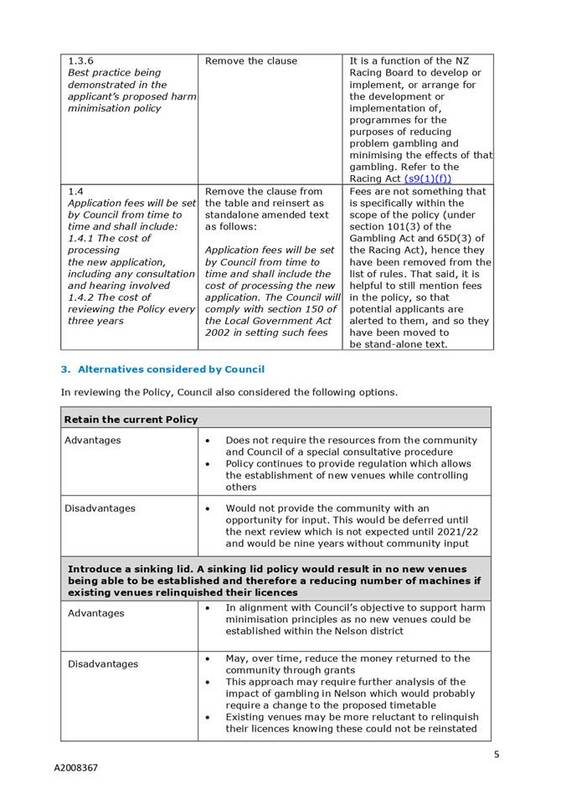 Responsibility for these areas does not fall clearly to a single Council committee. Therefore, the decision is referred to the Council. 1.1 To consider a request to change the qualifying development criteria of the SHA approved at 2 City Heights from 2 storeys to 3 storeys. 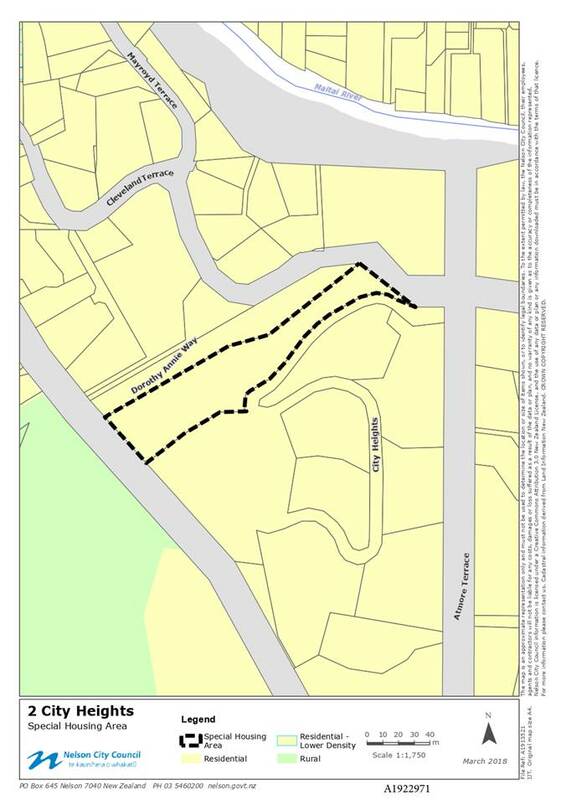 3.1 On 20 March 2018 Council approved a Special Housing Area at 2 City Heights. The Qualifying Development Criteria provided for a minimum of 5 units, a maximum height of 12m, and a maximum number of 2 storeys. 3.2 Since March the applicant has been working up a design and considering the Deed requirements. The SHA has not been gazetted yet as the Deed has not been entered into. 4.1 The site is steep and the only viable development form involves a piled construction that steps down the slope below the road. A 12m maximum height was provided for in the qualifying development criteria but only two storeys. The applicant seeks to modify the qualifying development criteria from 2 storeys to 3 storeys. This will enable a better dwelling design within the 12m maximum height already approved. 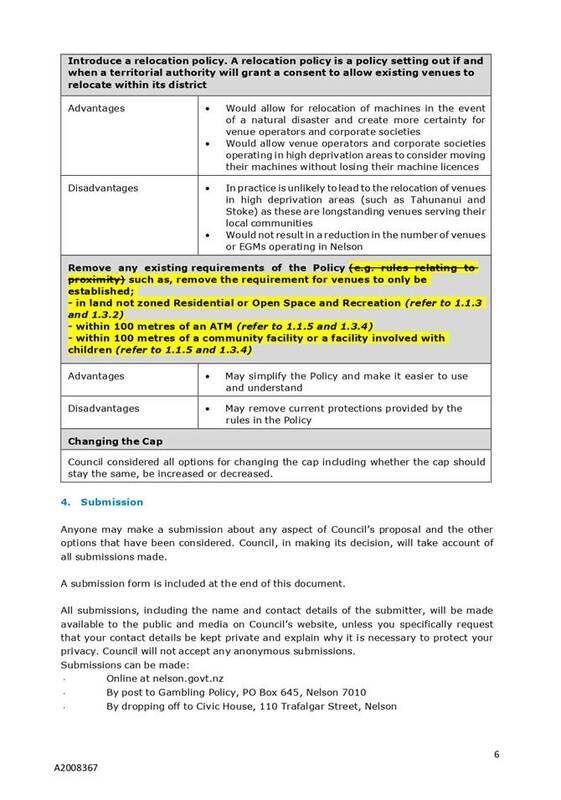 5.1 Council has two options, the request can either be approved or declined. The maximum height approved was 12m which is greater than the 7.5m in the Nelson Resource Management Plan which is associated with a 2 storey development. Changing the qualifying development criteria to 3 storeys is consistent with the maximum height Council has already approved. The applicant is still required to take the proposal to the urban design panel for approval as part of the Deed. There will be no overall height or adverse amenity effects created by a decision to approve. 5.2 If Council was to decline the request, it is unlikely that the applicant would be able to provide an economically feasible and practical design across the steep slope, and the site would likely remain undeveloped. 5.3 Officers recommend that the request is approved. This recommendation is consistent with Local Government’s role to provide efficient and effective performance of regulatory functions appropriate to present and anticipated future circumstances by using the enhanced regulatory powers afforded under the HASHAA and the Nelson Housing Accord to enable the release of additional land for housing. The recommendation is consistent with the Nelson Housing Accord and the Community Outcome: Our urban and rural environments are people-friendly, well planned and sustainably managed. 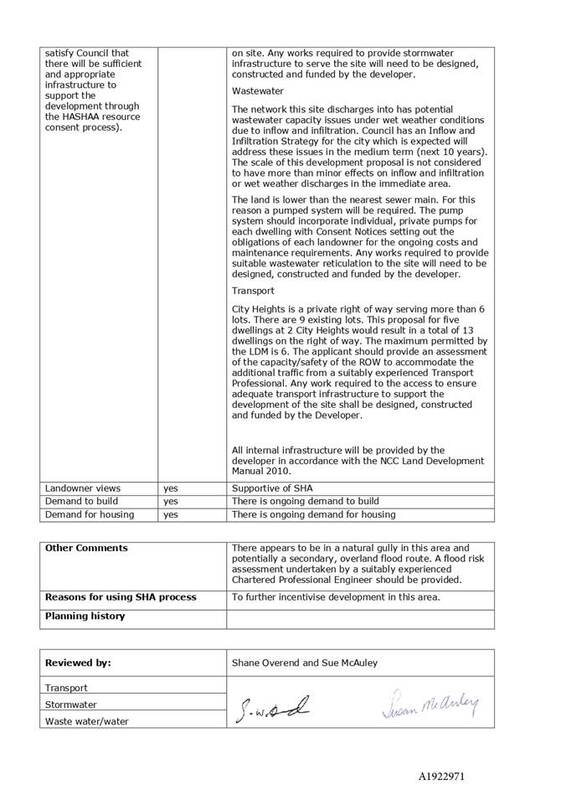 If the SHA amendment recommended in this report is not approved then there is a risk that development of that site is not enabled, and the goal of furthering the supply of residential units as part of the Housing Accord is not met. There is no financial impact of the SHA request to amend the number of storeys apart from administration costs covered by business as usual. The costs of processing qualifying development consents are recovered from the applicants through charges, which are applied similarly to other consent fees. This matter is of low significance because it is an amendment to an already approved SHA which can still be accommodated in the overall approved building envelope. No engagement with Māori has been undertaken in preparing this report.